Because the prisoners were being force-fed, Michael Gaughan’s death, on Monday 3 June 1974, came as a shock. He died from pneumonia; the force-feeding tube having pierced his lung. He was 24 years of age. 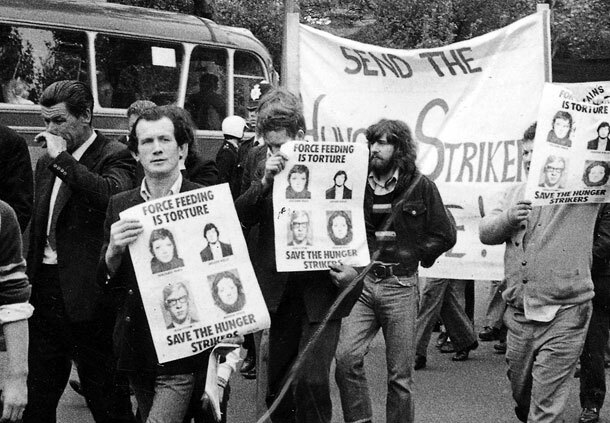 BOTH the hunger-strike deaths of the 1970s took place in prisons in England. The first, on Monday 3 June 1974, was Michael Gaughan of Ballina, County Mayo, followed almost two years later by another Mayo man, Frank Stagg of Hollymount, on Thursday 12 February 1976. 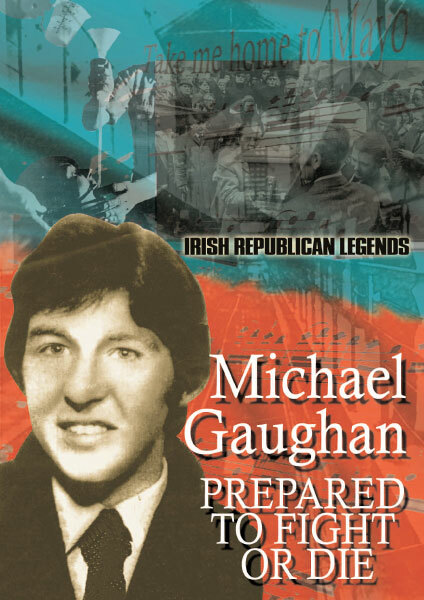 Michael Gaughan was one of the earliest IRA Volunteers to be imprisoned in England, being sentenced to seven years at the Old Bailey in London, in December 1971, for his part in a bank raid. He spent the first two years of his prison sentence in Wormwood Scrubs in London and then was moved to the Isle of Wight’s top security prisons: Albany and then, in 1974, to Parkhurst. Among the other Irish political prisoners there at that time was Frank Stagg, sentenced with other IRA Volunteers in Coventry the previous November, to ten years’ imprisonment, on the vacuous charge of conspiracy to cause explosions. November 1973 had also seen the trial in Winchester of the Belfast Ten (Dolours and Marian Price, Hugh Feeney, Gerard Kelly and six others), who had been arrested following bomb explosions in London the previous March. Having received life sentences, the Price sisters, Feeney and Kelly immediately began a hunger strike for repatriation to prison in Ireland. They were brutally force-fed for a total of 206 days. Michael Gaughan and Frank Stagg joined this hunger strike on 31 March 1974, first of all in solidarity with the other hunger strikers and also for the right to wear their own clothes and not to do prison work. On 22 April, 23 days into their hunger strike, Gaughan and Stagg were force-fed for the first time. They immediately escalated their demand to one for repatriation. “The mental agony of waiting to be force-fed is getting to the stage where it now outweighs the physical discomfort of having to go through with it,” one of the hunger strikers wrote to a relative. But the physical discomfort of force-feeding was considerable. During the operation, the prisoners were seated on a chair and held down by the shoulders and chin. A lever was pushed between the teeth to prise open the jaw and a wooden clamp placed in the mouth to keep it open. A thick greased tube was then put through a hole in the clamp, pushed down the throat and into the stomach. Often the tube would go into the windpipe and have to be withdrawn. During this procedure the victim would be constantly vomiting. Visitors to Michael Gaughan and Frank Stagg were only allowed to see them through glass screen, supervised by prison warders. In fact, Michael Gaughan’s last visit with his mother, three days before his death, took place in such circumstances. The death of Michael Gaughan caused major controversy in British medical circles and the use of forced-feeding was later abandoned by the British. More immediately, the four Belfast hunger strikers were promised repatriation and ended their hunger strike on 7 June. Frank Stagg, having received a similar undertaking, ended his fast ten days later. From the Isle of Wight to Ballina, Michael Gaughan’s funeral brought thousands on to the streets. On Friday 7 June and Saturday 8 June, thousands of people lined the streets of Kilburn in London and marched behind his coffin, which was flanked by an IRA guard of honour. 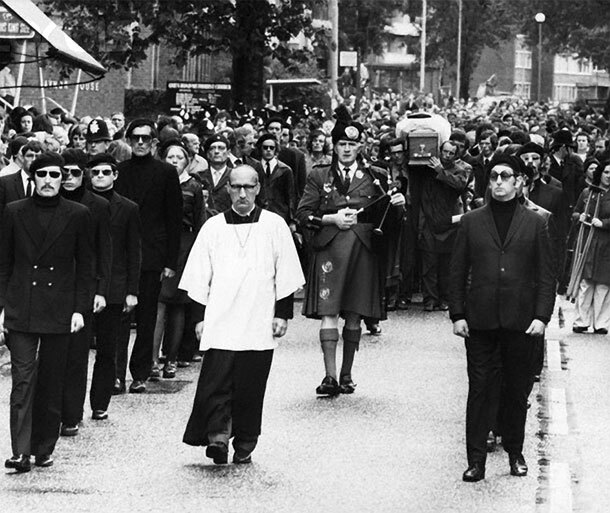 On Saturday, his remains were met by thousands more in Dublin and, flanked by IRA Volunteers again, were brought to the Franciscan Church on Merchant’s Quay. On Sunday morning, the cortege began the long journey to Ballina, stopping in almost every town and village en route as the people turned out to pay their last respects. In Ballina, there was a Requiem Mass in the Cathedral. 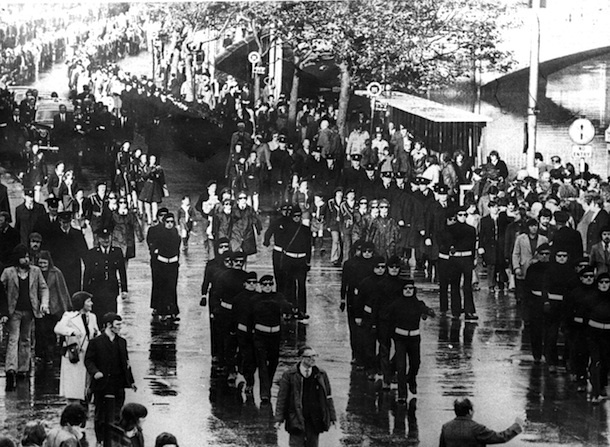 As the coffin was borne outside, a volley of shots was fired over it, before it was taken to Leigue cemetery, to be buried with full honours in the republican plot. A month after the death of Michael Gaughan, Frank Stagg was moved from Parkhurst to Long Lartin in Worcestershire. There, on 10 October 1974, Frank Stagg once more resorted to a hunger strike, because he had not been transferred to Ireland, and because he and his relatives were being subjected to degrading searches before and after visits. As soon as Frank Stagg began this hunger strike all his visits were stopped, although his mother was allowed a brief visit on 26 October. Thirty-one days into the hunger strike, he was told that his demand for repatriation would be met and he ended his hunger strike. In March 1975, Dolours and Marian Price were transferred to Armagh Jail and, in April, Hugh Feeney and Gerard Kelly were moved to the Cages of Long Kesh. 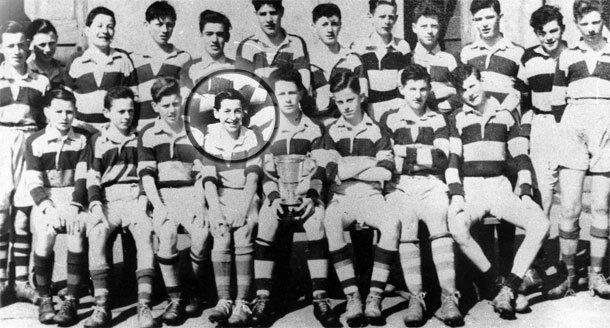 But Frank Stagg remained imprisoned in England. By this time he was in Wakefield, where he was being kept in solitary confinement because he refused to do prison work. 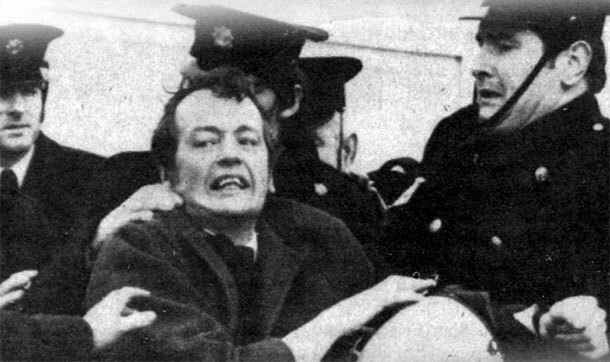 On 14 December 1975, Frank Stagg went on hunger strike once again. His demands were for an end to solitary confinement and no prison work pending transfer to a prison in Ireland. This time any promises from the authorities would have to be given in writing. 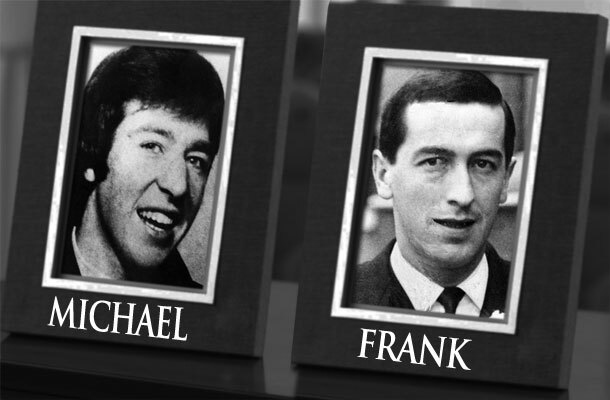 On 20 January 1976, Frank Stagg was given the Last Rites but, the following Sunday, the Bishop of Leeds ordered the prison chaplain not to say Mass in the presence of Frank Stagg. In spite of this, and much other pressure, Frank remained committed to his principles and, after fasting for 62 days, died on 12 February 1976. 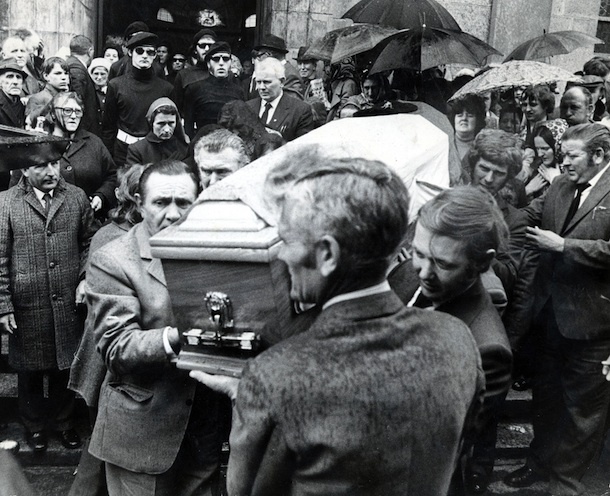 In order that he receive a republican funeral, Frank specified in his will that his body be entrusted to Derek Highstead, the then Sinn Féin organiser in England. The Wakefield coroner complied with this request. 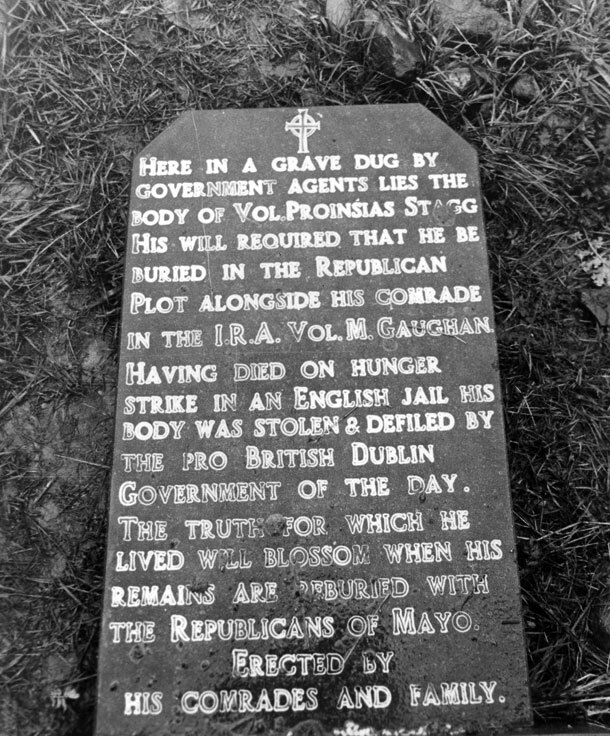 The remains of Frank Stagg were on the way to Dublin by air when the Free State Government, to prevent a display of republican sentiment like that which accompanied the funeral of Michael Gaughan, diverted the plane to Shannon Airport. Garda Special Branch men seized the coffin and locked it in the airport mortuary, preventing relatives from gaining access. The following day, the coffin was transferred by helicopter to Ruben Church at Hollymount in County Mayo. On Saturday 21 February, a Requiem Mass, boycotted by almost all his relatives, was held and his body was taken to Ballina, where it was borne by Special Branch men to a grave some yards from the Republican Plot in Leigue Cemetery, where he had asked to be buried. In the hope of preventing a transfer, six feet of cement was afterwards placed on top of the coffin. On the Sunday, the Republican Movement held its ceremonies at the Republican Plot. A volley of shots was fired and a pledge made that Frank Stagg’s body would be moved to the Republican Plot in accordance with his wishes. For six months there was a permanent 24-hour Garda presence in Leigue Cemetery but eventually it was lifted. On the night of 6 November 1976, a group of IRA Volunteers, accompanied by a priest, dug down beside the grave, tunnelled under the cement, and removed the coffin. After a short religious service they re-interred the remains of Frank Stagg in the Republican Plot, beside the remains of Michael Gaughan.